In light of the impending release of RINA's book, and the fact that SCANDAL's international store has more or less closed down leaving the Japanese website, I thought some people might want to buy stuff from Kitty Web Store but have no idea how to, so this a rough step by step tutorial with pictures on how to buy stuff from there using Tenso. You need a credit card that allows purchases from foreign websites for this to work. Disclaimer: I personally use another forwarding service, but since Tenso is the most common name thrown around I might as well make an example from this. I believe most forwarding services work more or less the same way with slight differences. All information used are taken from a Tenso account I created though. Not sure where to throw this, so mods can move this if needed. At this point if you intend to add more stuff you can go back to the shop, otherwise click on the button that is circled to proceed. Step 2: Enter your details. 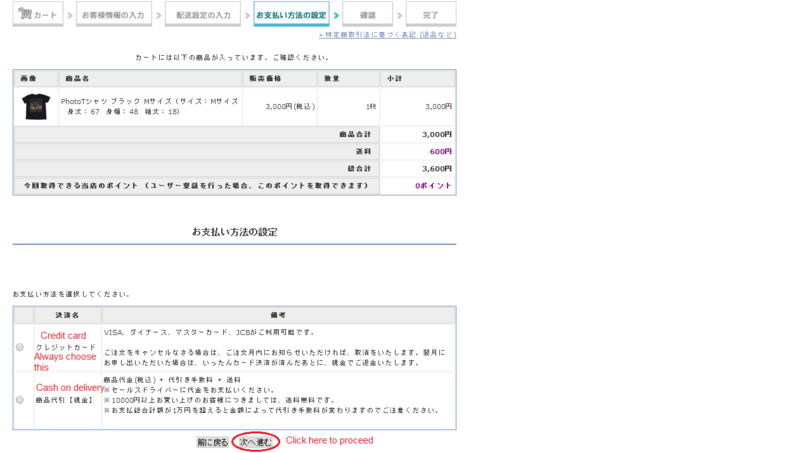 Technically what you're entering here is not your mailing address, this will be entered in the next page, but what you're entering now will be entered into the next page, so I just use the Tenso mailing address for convenience. 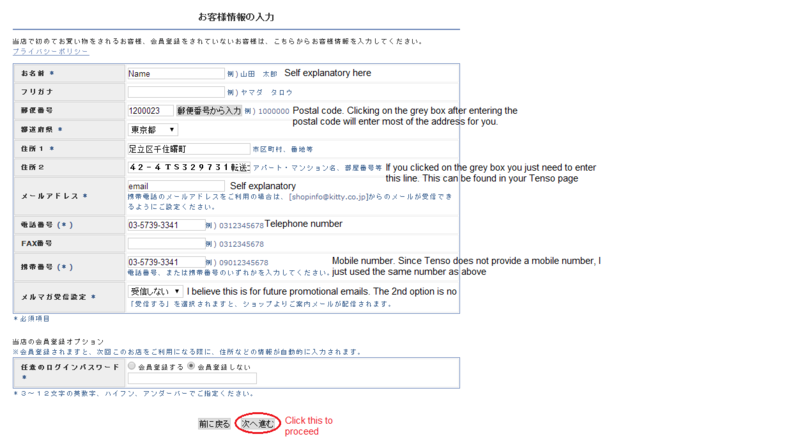 The Tenso mailing address can be found on the "My Page" tab after you have registered. I forgot to add this into the image, but the name should be your own name, not Tenso. I think it can be written in English, I didn't get any errors during my test run. If you're using another forwarding service do check how they want the information to be entered. For example the one I use asks to include my ID in my name instead of my address, so do take note. The next page is the mailing address. 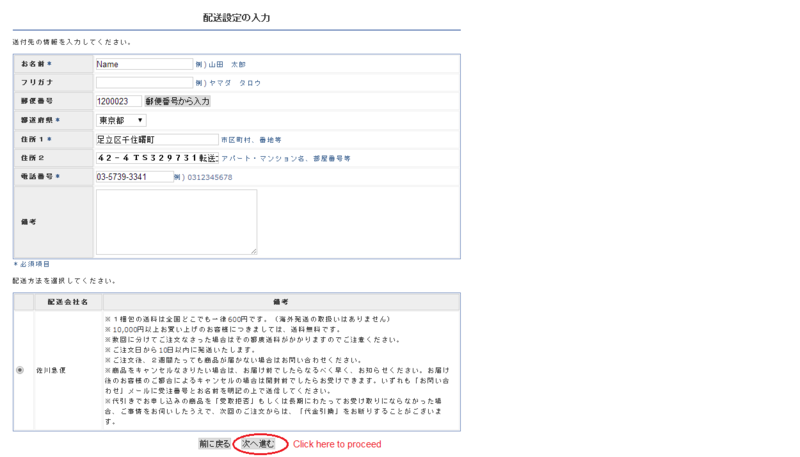 As you can see the details from the previous page are transferred completely on to this form, so if you filled out the previous form with your Tenso address you can carry on without changing anything. If not, make the necessary changes to make sure they ship to the warehouse. Btw that bottom box indicates the shipping method. Right now there's no choice, not sure if anything will change. The next page is the credit card details. Confirm all your details are correct on the next page, and click on that 2nd button all the way at the bottom, and YOU'RE DONE (I think). Now just wait for Tenso to email you that your item has reached and you can happily ship it back home into your welcoming hands!! Thank you soo much for the help! Thanks for you help. I just created a Tenso account today. Is it possible to order items from different merchants like Kitty Shop and Ishibashi, deliver to your Tenso address, store those over a period of time, and deliver all items at the same time to your intenational address? All, if not most places offer free storage up to a certain time i believe, beyond which they will be charging a flat rate per item per day, at least that's what the forwarding service (not Tenso btw) i use do. You should be able to find all these on their website. They can't possibly be allowing you to store your stuff for an unlimited amount of time, it's just going to take up space in their warehouse, that's why they need to charge you if you store them for too long, like 15 days for example. As long as all your items arrive within a certain period it's fine, even if they're from different stores or websites. @metalleo: Thanks for your advice. Thank you! I had to keep referring to your post when I bought some goodies the other day and had them sent to Anislo. I was worried they'd never make it as there was no updates for about a week, but they're now being handled by Australia Post (and should be in my post box this morning or tomorrow).